3.Two front pocketsare very practical, suitable for storing small articles such as mobile phone. 5. Integrated breathable mesh pad in the back, breathable and not muggy. 6. The waterproof nylon fabric, prevent the items inside from being wet. HIGH QUALITY MATERIAL:1000D CORDURA Fabric,420D PVC lining,YKK Ziper,heavy-duty construction,resistant scrapes and tears.It is lightweight and touch soft. REPLACEABLE 3L BLADDER: Includes a 0.4mm thinckness 3L/100 OZ Food grade TPU material Water Bladder Reservoir, Insulated tube, BPA free,Tastefree.Includes a wide screw cap so you can add ice cubes to keep your drink even colder. It holds enough to get you through a day of hiking,cycling, running or period after biking ADJUSTABLE SHOULD & CHEST STRAPS:Will fit chest sizes from kids and teens as small as 27" up to adults with a 50" chest. 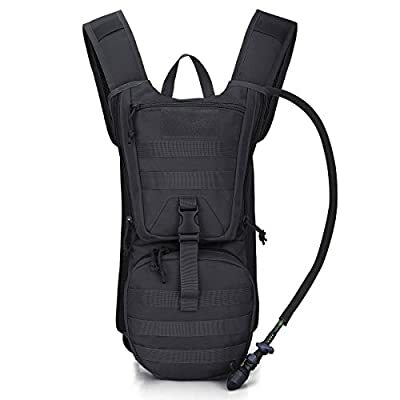 The chest straps make sure it doesn't bounce when you move; Includes a whistle buckle for emergency COMPACT DESIGN & MOLLE SYSTEM DESIGN: 19"x10"x1.5" in size; Front pockets can hold your wallet, keys, phone, towel, or small tool.Molle system can expand any extra gear which you like! INSTRUCTION OF LOCKING THE BLADDER:Step 1:Let the edge of the bladder cap out to make the backpack lock it.Step 2:Insert the small small buckle.If any question about the methord,just feel free to contact us.